The term alpha male and female was coined by Lorenz Conrad who studied the behavior of wolves in the 1960s. In wolves, he observed, the alphas protected their pack, were the only ones who mated and led hunts. The term has been used in recent times to describe humans in leadership positions and those who are most financially successful. The obvious problem with this analogy is that humans are not wolves and have split from that evolutionary chain millions of years ago. However the behavior we have witnessed in many self-proclaimed alphas is not how we expect alpha humans to behave but how one would expect scavengers at the bottom to behave. Let's not regress to what we have already evolved beyond. We remember our Vets so we do not forget. It appears that we have forgotten what we are supposed to remember them for. Coincidentally, the generation that warned us is dying out or considered too old to matter. Through the vast reach of media the highly charged vitriol has affected all of us. That was the point. We all have friends and family that have been undeservedly shoved into the lowest category. Do not listen. Shut it off the way you would close a book that is a waste of time. Remember that the world has become a stage again. There is a great line in a bad movie: What can you do with 3 billion dollars that you cannot do with one? A very long time ago, on a unique planet, (known to some as let's treat it like dirt), mammals took over the earth. At least they thought they did. Or made others believe they owned what they did not. It is unclear when Orange Utans split off the tree of evolution. Then came the great regression to hairy times. Sensitive creatures that they are, some can be spotted in their natural habitat wearing baseball caps as they attempt to mimic human behavior. 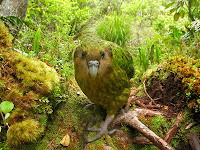 The Kakapo is what happens when there is no predation and nature gets creative. 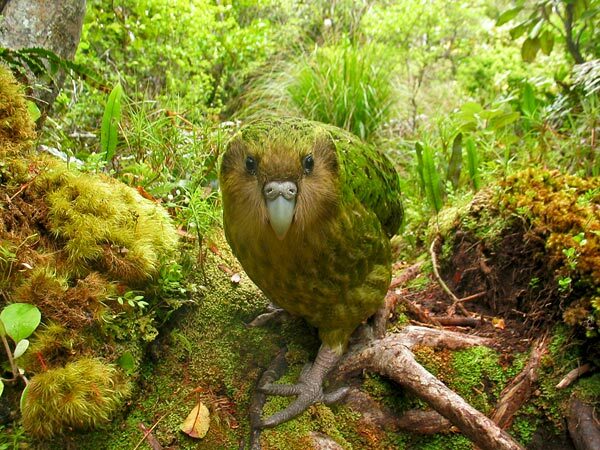 It is the world's only flightless and nocturnal parrot and found only in New Zealand. Unlike other parrots it can store fat, may have a natural longevity of 100 years and apparently smells like fruit. When population control is left to nature, the intricacy is astonishing. The female lays only a few eggs and only when triggered by the production of large crops, the "mast year", of the rimu tree species. The solitary male then produces booming sounds and hikes for miles to find the equally solitary female. Once estimated at over 200000, the Kakapo came close to extinction several decades ago, through the imported predation of cats and dogs. Conservation measures have been successful and the number has increased from 40 to over 100. Something this comical and special has to be kept alive. What would a Utopian community look like? In great moments of human civilization we have already achieved advancements that have greatly improved lives. We have sanitation, vaccines to prevent disabling conditions, toilets and showers. We have saved species from extinction, created the internet and 3d printers and discovered planets that may one day be habitable. The list is of what we managed to create is long. If we could keep that type of momentum going and do not keep reverting to old habits, we could create the same for the majority of the population and deal with climate change, poverty, hunger etc. 1. Support the younger generation again by rewarding those with novel and creative ideas with access to free education and retreats to communicate their ideas. 2. After the current building boom of "quick , dirty and unliveable", we need to start building better again. Deeper structures and better insulation that can withstand climate change. 3. Companies that do great work should be fostered and rewarded. Autonomy of their employees will likely see a return. 4. Better city planning would see a return to accessible shopping and self-reliance in case of emergency. The loss of electricity is likely in our future, we should have alternatives in place. 5. More individuality. Greater tolerance toward those who may be a little different, but just as valuable. 6. Taxes are important. So is governance. But for too long our earnings have been disappearing without reaching anyone, but those who need it the least. Completely new systems will have to be created. How this will be accomplished, I have no idea. A start might be coalition governments without career politicians at the table. 7. Transportation to deal with climate change and fuel economy. The combustion engine is almost as inefficient as it was 40 years ago. Magnets may provide one solution. Amphibian vehicles to deal with any flooding. (I am actually serious about this one). We are going to need them. Prototypes of flying cars are out there somewhere, but may create 3 dimensional traffic jams. 8. While we need to respect cultural differences, we also need to realize that we are one species, not "races" and that the basic wants and needs are almost universally the same. What would a utopian global community look like? That is a question I have been asking myself my entire life. The complexity of such an answer would require a book length discourse and a planet size computer. Potentially, if the internet continues to evolve, we might have the latter. One of the benefits of watching animals is to realize that we have been behaving as no more than "just another animal", despite our remarkable ability to envision, build and create. As a species we are stuck in an endless continuum of immaturity-we build, we acquire, we destroy and abandon those around us. Money continues to be poured into wars and their expensive toys, greed rules many of us and we fight for territories, wealth and status. It is irrelevant whether those social structures are ruled by oligarchs or feudalists or whatever new name we apply to them, the outcome is the same; the majority suffers. In one form or another this has been the case throughout human history. But. We could evolve. Create new systems, avail ourselves of technology to make our lives less complicated, prevent illness rather than treat it for decades, improve both the quality and quantity of our lives and so on. One option would be to have a Google like approach to science and innovation. Private or public companies that would take care of the mundanities of life and allow the thinkers and creators to come up with solutions in a playful think tank type of environment on their own schedule. This is the type of wishful thinking that has always existed, but it is in many ways the internet and social media that may be used to move us dreamers forward. Thanks to a documentary, I learned that Ravens travel and live with extended family. It is strange to think that sitting in the branches above us are dark winged cousins, aunts and grandparents. I watched behavior that is mostly incomprehensible. Twigs are selected, stripped with beak and talon (I did not know they could do that), and then discarded. It reminds me of woodworkers, who are not happy with their work. On rooftops they hide food under shingles. Clever. They seem to prefer wealthier areas, possibly because the roofs are better maintained. They take rainshowers with joy. Sentinels sit on peaks and warn others of threats; or they could just be discussing the weather. Shift change involves preening of the one who is leaving. You don't see that in the human world. I was surprised when I watched a lone raven prevent a significantly larger falcon from gaining altitude with a startling display of speed and maneuverability. It flew above the falcon, anticipating the falcon's moves, preventing it from getting sufficient lift for its larger wingspan. They watch us. They watch me watch them. And they think. They are the true eyes in the sky. We search for intelligent life in other solar systems, but cannot communicate with the intelligent life around us. Visit or follow. It's up to you. I collect enough things already.
. . . All Finite Things Reveal Infinitude . . . Copyright © 2011 by Antares Cryptos. All rights reserved. Simple theme. Powered by Blogger.